Realme 3 Pro was spotted in several leaks for the past few months, we saw various rumours, teasers, specs leak and now finally the teaser poster has been shared. It reveals some details about the phone and its launch date that is scheduled for April 22 at 12:30 pm in New Delhi, India. The smartphone launch event is in Delhi University Stadium which is mainly done to target the youth. To recall, the company did same with the Realme 2 Pro that launched at another university targetting youngsters. Since speed is what the youth loves, the poster states,” Speed Awakens” hinting the updated internals of the phone. Rumours suggested a Qualcomm Snapdragon 710 SoC and if it is legit we might get a worthy competitor to the current crown holder Redmi Note 7 Pro. 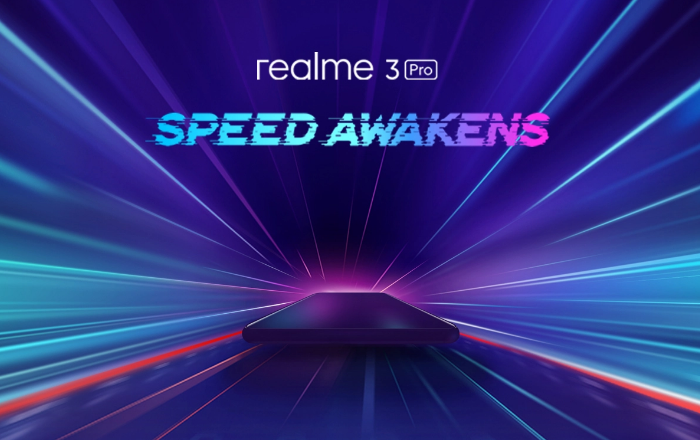 Some of the leaked specifications of the Realme 3 Pro are also interesting and looks like that it will compete head to head to the Redmi Note 7 Pro smartphone. The phone is rumoured to sport a larger display and bezel-less design. It is expected to come in three variants, 4GB RAM, 6GB RAM and even 8GB RAM variant. It is also said to come with a great set of cameras. All of this will be boosted by a massive battery, however, the exact capacity is unknown, but what we know is that the phone will support VOOC fast charging. Other than this, there is very less information on the phone and we might have to wait till the actual unveiling of the phone on April 22 at Delhi University Stadium. Stay Tuned for more updates on Realme 3 Pro and also Subscribe to Our YouTube Channel Gadget Gig For Latest News, Reviews, Unboxing and Tips/Tricks.